Balochistan University of Information Technology, Engineering and Management Sciences GAT Subject Test NTS Test Roll No Slip download online from here. NTS wll organize the test on Sunday, 21st April 2019. Balochistan University of Information Technology, Engineering and Management Sciences committed to providing quality education. BUITEMS paying attention on research and to equip students with the art of living as productive members of society, contributing to the socio-economic uplift of Pakistan in general, as well as Balochistan in particular. At BUITEMS students are lead to harness the richness of content and diversity of communication in an environment conducive to learning. The City campus of BUITEMS Which fulfill the faculty of Management Sciences. While the Takatu Campus, accommodating the Faculty of Information and Communication Technology. All those candidates who apply for GAT Subject Test in BUITEMS. Now waiting for their test roll no slips. So that they are able to appear in the test. List of candidates is available here. You can download your BUITEMS GAT Subject Test Roll No Slip from here. 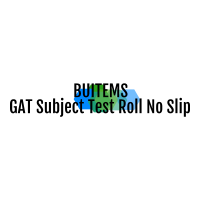 How to Download BUITEMS GAT Subject Test NTS Test Roll No Slip ? You can also take the print of your roll no slip of buitems test. Select the print option and press the (ctrl+p) and get the print of the BUITEMS GAT Subject Test Roll No Slip.